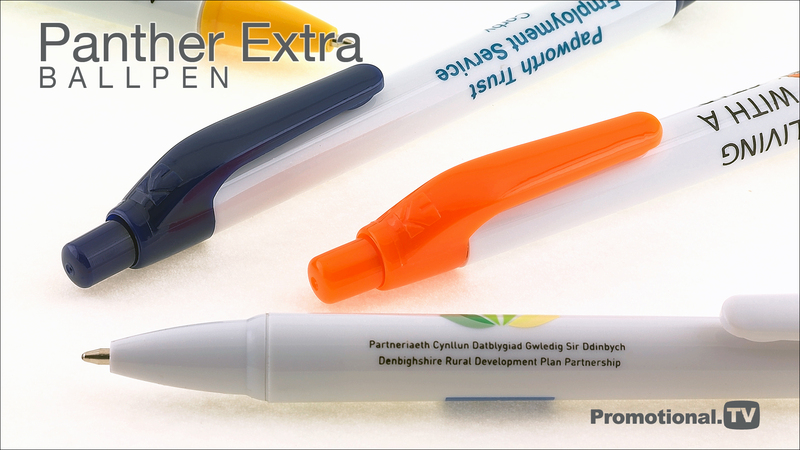 Distinguishable from the rest of the Panther range by its high gloss white barrel and contrasting coloured trim the Panther Extra Ball Pen is ideal for low cost promotions in a wide variety of applications such as exhibition giveaways, corporate hospitality, training seminars and general promotions. Our unique construction means it is compliant with current safety regulations; It comes with a black refill containing documental quality ink and is available on our 24 hour express service at no extra cost to you. The Panther Extra operates on a pushbutton mechanism and has the same large print area on both the barrel and clip as the Frosted and Eco-Friendly versions to accommodate even the largest corporate message or logo. It can be provided with a range of optional presentation packaging, including high visibility pen pots for you to use at your next corporate event.